ARM only just revealed its Coretex A9 chips, it seems–dual-core madness that’ll make next-year’s smartphones and tablet PCs serious competitors to laptops. And now here’s the A15. With four cores. And speeds up to 2.5GHz. ARM only just revealed its Coretex A9 chips, it seems–dual-core madness that’ll make next-year’s smartphones and tablet PCs serious competitors to laptops. And now here’s the A15. With four cores. And speeds up to 2.5GHz. “Wow” would seem like a good prediction for how you’ll react to the first smartphones sporting the silicon in 2013(ish). ARM is pushing the innovations of this chip pretty aggressively: According to the press release, the A15 “MPCore” processor is the “highest-performance licensable processor the industry has ever seen,” offering “unprecedented processing capability, combined with low power consumption.” And where does ARM see its design finding a home? Pretty much everywhere, it seems: From “smartphones, tablets, mobile computing, high-end digital home” products to “servers and wireless infrastructure.” While these latter market segments are fascinating (the low-power chip/server industry is getting pretty exciting, and having powerful ARM chips in wireless systems could transform how we use wire-free Net products) it’s the very first two items in this list that’ll appeal to Joe Q. Consumer. 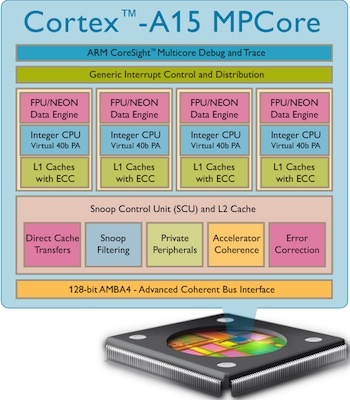 This is for one reason alone: ARM quotes the abilities of the A15 as enabling “five times the performance” of the current crop of smartphones, thanks to its speedier out-of-order CPU design, four processor cores, clock speeds of 2.5GHz (compared to today’s typical 1GHz) and better support for floating-point calculations and media–meaning it’ll excel at gaming with real-physics abilities and processing full-resolution HD video content. Meanwhile support for an enormous 1TB of RAM won’t affect the smartphone game, where memory price is still a significant factor, but will have big implications for desktop servers/supercomputer applications. This is speculative, but reasonable given the current developments in smartphones. Since ARM already has a compelling lead in the mobile devices CPU marketplace, the news about the A15 is also an aggressive shot across the bows of both Intel and AMD. Each of these chip makers, legends in what may now be the “old” paradigm of desktop and portable computing, has fresh chip designs on the board that’re aimed squarely at the mobile and low-power server market–Intel with its future Atom silicon, and AMD with Bobcat.